If you have an unquenchable thirst for speed in relation to charging your devices, then this deal could be of interest to you! The highly-rated and reputable Anker PowerPort C1 USB-C wall charger is currently being offered for just $10.49. 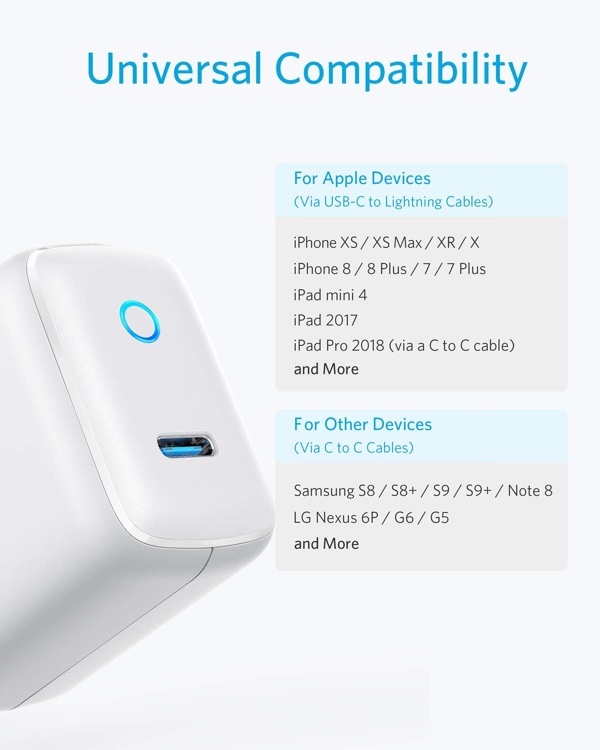 Anker is regularly letting the world know that it has an army of 30 million+ individuals using its products on a global basis and this is how it describes the PowerPort C 1 product. A compact, travel-ready wall charger that delivers a high-speed charge to USB-C phones and tablets. Stows easily in palm, pack, or pocket with the foldable plug. A simple, straightforward, yet deceptively powerful charger for our mobile world. It’s that last part which is extremely important here in the fact that we do live in a “mobile world.” This basically means that more and more of us are carrying mobile devices around and have more than one device in our possession. And, inevitably, we are going to need those devices charged and kept full of power so that we can use them. This Anker portable and foldable plug does exactly that by offering connectivity via USB-C in order to facilitate high-speed charging for smartphones and tablets. It’s lightweight enough that it doesn’t take up much space when it is actually plugged in and is capable of offering an up to 15W (5V/3A) USB-C output for those devices which are compatible with fast charging. It also comes with a very nice and elegant design that should look great in your home or office and which has an ice blue LED front and center in order to immediately give you visual feedback on whether or not the product is active. Fr0m a safety perspective, you are looking at surge protection, short circuit prevention, and temperature control, which means that the product itself, as well as your smartphone or tablet, should always be safe when it is being used. If you have been looking to replace an existing wall charger or just want to upgrade to something which offers high-speed charging then this is definitely the deal for you. I mean seriously do you guys ever vailadate what you spew on this website for ad revenue? This is the second time in two weeks I’ve seen one of theses and been like yeah I’ll get one of those and the code is invalid. Is the trick that clicking on the link you get your ad money and the codes are made up?